This is a translation of a tvxs.gr article. The ways many immigrants lacking the necessary documents are denied access to public health services in Greece are highlighted by the «Report on the health of Immigrants in Greece». The report was issued by the Department of Hygiene, Epidemiology and Medical Statistics of the Medical School of Athens University. As noted in the report, approximately 1,000,000 immigrants living in the country face many obstacles and incredible difficulties regarding their health care, in contrast to other European countries, which have created databases with information about access and care in the health system. The situation gets even more difficult due to factors such as bureaucracy, long waiting lists, inadequate infrastructure and other chronic problems of the health system; one more such factor is the lack of public information services concerning the legal status and rights of different categories of foreigners. The arrivals of refugees at the Aegean islet Agathonisi do not cease. This is a translation of a Kathimerini article. «Even sea urchins have a name here» fishermen say in Agathonisi. «There are so many passports, travel documents, bank notes at the bottom of the sea, that to each sea urchin corresponds one» explains the rural doctor of the island, Mr Michael Christodoulou. Nearly 700 immigrants and refugees have arrived since the beginning of the year and it is only March. Afghan, Somali, most Palestinians, or … so they say. The latter heve made their appearance again in the dealings of the immigrants smuggling business after the recent Israeli operation in Gaza … Humanism alternates with anger among the 100 residents of the islet and the affection for children and infants gives its place to suspicion against the invaders. «People are friendly here. But soon they will become inhospitable» comments the physician. «They get tired …». Not only Alexis Grigoropoulos died on the 6th of December. This post is about the tragic conclusion of one of the victims of the Petrou Ralli continuous crime. It is a rough translation of this blog post. A 24 year old Pakistani died at dawn of Saturday the 21st of March after three-months of fighting for his life. Mazir was in a comatose condition in the General State Hospital of Nikaia in Athens since the 6th December, when he was found in a ditch, 600 m. away from the Asylum Police at Petrou Ralli. Although there were no eyewitnesses, something weird happens at Petrou Ralli. Within two months there have been three deaths at the same spot, on the same weekday (Saturdays: 25th of October , 6th of December, 3d of Janouary) and at the same time of day (dawn). Witnesses have reported that they last saw the victims running to escape from police pursuit. Each Saturday at dawn thousands of refugees gather at Petrou Ralli, expecting to receive the so-called “magic ticket” that books an appointment with the Asylum police service to submit their application for political asylum. The officers of the police station in their effort to impose order resort to their usual methods. The authorities issued a notice for the first of the three deaths, according to which the 25 year old Pakistani who died on the 25th of October fell to the ditch because he lost his orientation and balance while trying to find a place to urinate. No other statement has been issued. The phenomenon of impunity and its consequences is something we know very well in Greece. This impunity was one of the reasons for the outbreak of violence last year. If the government continues to treat this way the people who come asking for help, the rebellion of the Paris Banlieus will be nothing compared to what will happen in Athens. For how long will immigrants be patient? The revolt that erupted during the last few days (in Chania and Thiva prisons primarily) is one more link in the incessant fight against the officialised penal barbarity in Greece, a struggle that is bound to peak again as long as the promises made by the government after the unprecedented prisoners struggle of last Autumn are systematically broken. Immigrants are disproportionally hit by the vengeful penal system in Greece. One of the incidents that sparkled the Chania prison insurgency was that 20 immigrant prisoners had been kept locked naked for two days in the isolation chamber. Posts in Libcom.org here and here. The silence over this is nothing more than an orchestrated cover-up (self-cencorship does the job as good…]. 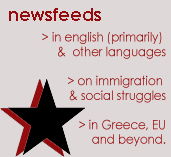 We translate here the article of the Assembly of the Occupation at the Association of Journalists of Athens [ΕΣΗΕΑ] blog . They are not. The journalist Giorgios Frangos, working for the press office of the Municipality of Athens, a close associate of the mayor of Athens N. Kaklamanis, and a sinecurist to at the Municipal 9.84 radio stations), who recently had «strange» dealings with right-wing groups, stabbed on last Tuesday evening a Nigerian immigrant. Despite his ridiculous claims that he was attacked by ten Nigerians with crowbars and knife, the charge on which he is now held in remand is unprovoked attack with a knife against the immigrant. Once the usual victim and culprit roles are reversed, the facts cannot be utilized in strengthening the media-promoted doctrine of insecurity (under which all kinds of violence are reported in the same way to promote terror-sensationalism), and this piece of news gets so much under-reported and downgraded, that it becomes “not exactly news”. Frangos has also been awarded by the (Journalistic) Foundation Botsis, so guild Omertà is also to blame for the silence. 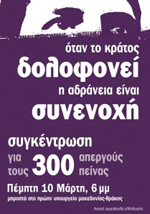 Below is the first announcement of the ongoing (since the 16th of March) Occupation at the Rector’s Office of AUTh, against the subletting working condition in Universities and anywhere the most severe exploitation of immigrants and Greeks is hidden behind contracts on sub-contracts on sub-sub-contracts and so on…. Here is the occupation’s blog…. With Konstantina Kuneva and all those hit by neoliberal barbarity. We post with some delay on this, but the events in Aegaleo are and unfortunately will remain relevant for what is the everyday relation between the impoverished ones in poor urban districts across the Greek territory. On Tuesday 3 and Thursday 5 of March a group of young Greeks held a series of racist attacks against Pakistani immigrants in Aegaleo, Athens. They beat and injured dozens of immigrants, two of whom got hospitalized. The beating and robbing of immigrants is not new in the area, where the last two years organized racist groups have made dozens of such attacks in the street or after invading the houses of immigrants. The racist groups had been for long acting with no restrain from the police. On the night of Thursday March 5, however, the police identified and arrested three persons, two of which were identified by the victims of the attack They are now detained and waiting for the trial. Three immigrants were also led to the Police Station for carrying wooden clubs to defend themselves. .
Two days later, immigrants and antiracists gathered to protest against the rising of racist violence in the western districts of Athens. What follows is the translation of a brief analysis on the events by the Initiative of Anarcists in Aegaleo. Early on March 21, 1960, between 5,000 and 7,000 people converged on the local police station in the township of Sharpeville, South Africa to protest against Appartheid laws. By 10:00 am, a larger crowd had gathered, and the atmosphere was peaceful and festive. Despite this, the police and military used low-flying Sabre jet fighters to attempt to intimidate the crowd into dispersing, a tactic that had been successful at similar protests. The police set up Saracen armoured vehicles in a line facing the protesters, and at 1:15 pm fired upon the crowd. They continued firing even when the crowd had turned to run, and the majority of those killed and wounded were shot in the back. The official figure is that 69 people were killed, including 8 women and 10 children, and over 180 injured, including 31 women and 19 children. This historical snapshot of the most deadly segregation between people is not something of the past or of other continents: right now, right here, wherever you are in the EU-megastate, a new Appartheid regime is being raised around us, and people are murdered everyday trying to go through its walls…. Drawing from various sources we report below on some recent developments in the high-tech side of the Fortress Europe killing and exploitation machine. The supposedly democratic side of the EU, its parliament which will be asking for eu-citizens votes some months from now, voted for further steps to be taken in the integration of biometric – electronic surveillance apparatuses. This will allow for the rationalisation of cheap labour provision in Europe – the trivialisation, that is, of deportation of “seasonal workers”, which immediately affects 8 million people. 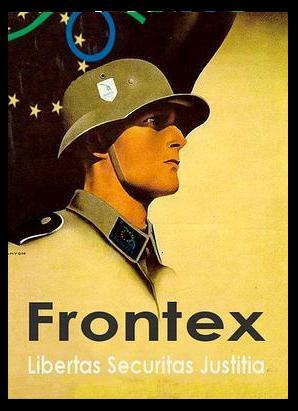 The banality of the EU-bureaucratic discourses does not render them less dangerous – only smellier with totalitarianism. We should also mention that the state in the territory of which these lines are written, Greece, asks to host on its ground many of the now forming EU agencies which will serve the above oppression functions. We do not bother here mentioning those who only raise “concerns” or “complaints” about this full-blown attack on humanity. Uncompromised solidarity and struggle will be our response.